Summary: Juliet Lyman is a senior executive at Yesterday Records. Music is her passion and she's very good at her job. That's why her famously philanthropic boss Gideon sends her to Majorca, Spain to work with a very tortured, but talented client. Lionel Harding is one of the best song writers of the 20th century, the multi-Grammy award-winning lyricist of the third most recorded song in history. But now he's 42 and six months overdue on the his latest paid assignment. Juliet is not leaving Majorca without either new lyrics or a very large check. To Juliet, business comes first. Emotions are secondary, and love isn't even on the menu. But to Lionel, love is everything, and he blames Gideon for his broken heart. He's determined to show Juliet that nothing is more important than love, but Juliet is just as determined to get Lionel to create the music that made him famous. If she can sign up local talent, even better. Her new friend Gabriella has a voice like an angel, but she's not interested in fame. Her grandmother, Lydia, wants the world for Gabriella, and she wants Juliet's help to give it to her. As her professional and personal lives start to mix for the first time, Juliet is forced to reevaluate her priorities. Gideon hasn't been totally honest, and love may be the only thing that gives them all what they need. Over the past few years, I have enjoyed some of Anita Hughes' novels. They are usually sweet reads with some romance thrown in for fun, and the settings are just incredible. 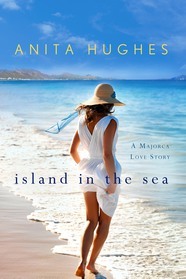 Her latest takes place in the gorgeous island setting of Majorca, Spain, and is called ISLAND IN THE SEA. ISLAND IN THE SEA tells the story of Juliet Lyman, an executive with a music company located in Los Angeles. Juliet has always loved music and has certainly established herself as a capable exec; however, that hasn't left much time for friendships and romance. Her boss sends her to Majorca to work with Lionel Harding, one of the most successful songwriters in recent memory but also one of the most troubled. Lionel owes the record company an album that he's already been given an advance for, and Juliet is supposed to make him pay up with either songs or money! Juliet arrives in Majorca and is blown away by the sheer beauty of this island. But she realizes that work comes first and she sets out to pressure Lionel. She encounters a very broken man who believes that love can conquer all... except when it comes to writing new love songs! He asks that Juliet listen to his entire story and then decide if she is going to make him pay up. As Juliet gradually hears Lionel's story, she also discovers a potential love interest along with a young woman with an amazing voice. She decides that if she can sign this woman to a recording contract, she might not be in as much trouble with her boss for not delivering Lionel's songs. She also finds that maybe love is missing in her life and that there's more than just a music career in store for her. ISLAND IN THE SEA was a sweet book that fans of love stories might appreciate a bit more than I did. It's not that I didn't enjoy the book, it's just that I'm not a huge fan of love stories and I found that it was somewhat predictable. I did appreciate the characters and how the book was constructed, with stories going back and forth between the present and the past; however, I wouldn't say it was my favorite one of Ms. Hughes' novels. What I did really enjoy about the novel was the setting of Majorca. Oh my gosh -- it just sounds like a beautiful place. As I've come to expect from Ms. Hughes' novels, she brought the setting to life and definitely made me picture this island perfectly. I could almost see the buildings, the people and even the sea. In addition, I love how she talks about the food that is native to the area. I swear I was hungry (and dying for a vacation) the entire time I read this book. There is a reading guide available for ISLAND IN THE SEA. I think many book clubs would enjoy reading and discussing this novel especially during vacation months. It really is a fun, escape read. You group might want to explore the meaning of the title for starters. Some of the more serious themes you might want to discuss are love, choices, forgiveness, sacrifice, betrayal, depression, friendship, and honesty. Overall, I liked ISLAND IN THE SEA but I didn't love it. I think readers who appreciate love stories and escape reads are definitely more of the target audience for this book. This would probably make a great beach read.